While roaming around the farmers’ market last Sunday, I noticed a table with a few cartons of berries. Even though every other booth had berries, I headed over to see what the seller had because two things were apparent: he was only selling berries and the berries must have been delicious- they were almost gone only a half hour after the market opened. Blackberries, blueberries, and one lonely package of black raspberries that I hastily snatched. 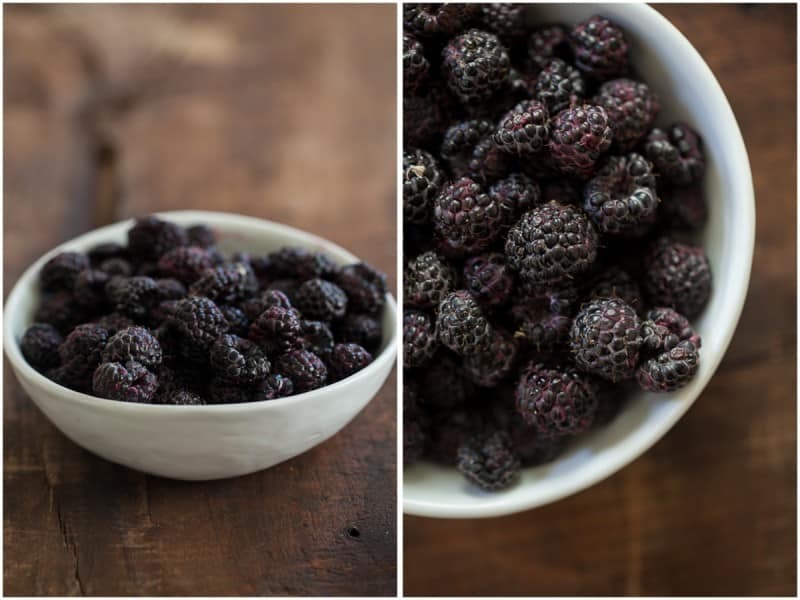 There are certain things that make me have a moments pause about moving 2000 miles away from home and these black raspberries did just that. It would be around this time of year that I would go tromping through the woods by my parents’s house in search of wild black raspberries. I’d look forward to it every summer and sometimes the berries wouldn’t make it back to the house because my philosophy was pick 3, eat 2, eat 1 one on the way back to the house. These waffles are pretty much my perfect lazy breakfast. I love the slightly earthy taste of rye that doesn’t overpower the taste of the black raspberries. 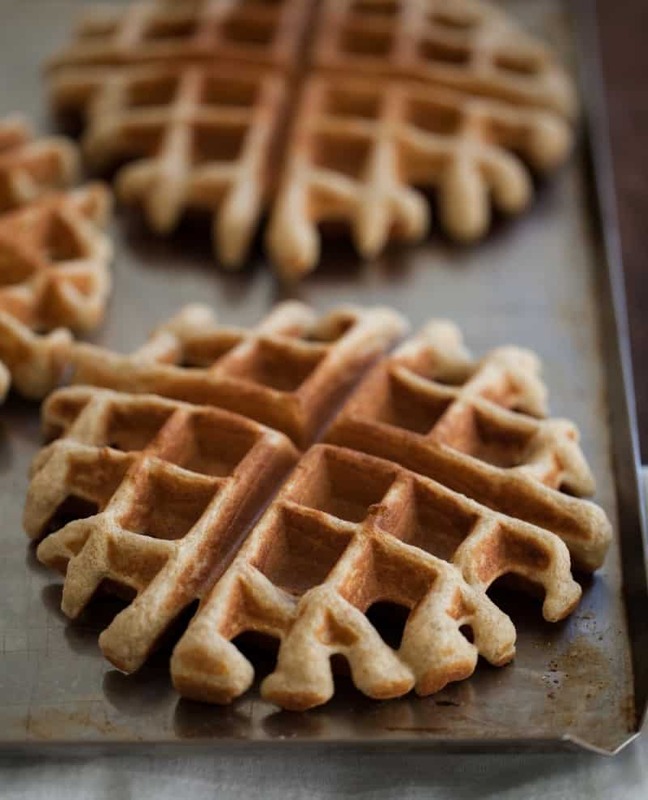 The whole wheat pastry flour helps keep these waffles light but you could always use 100% rye flour and I think they would still be wonderful. Preheat waffle iron and preheat oven to 200˚. 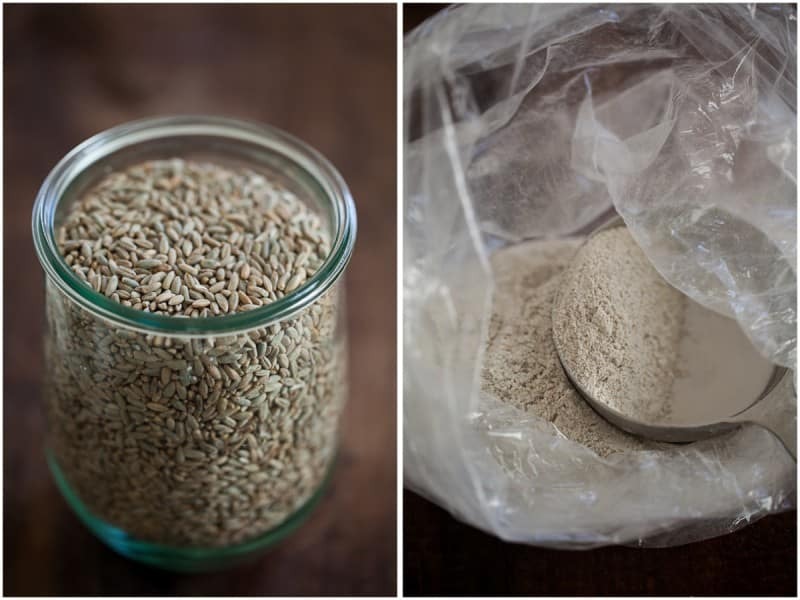 In a bowl, combine rye flour, wheat flour, baking powder, and salt. Stir to combine. In a separate bowl, whisk together eggs, walnut oil, sorghum, yogurt, milk, and vanilla extract. Pour into dry ingredients and stir until combined. Pour a 1/4 of the batter into a waffle iron and cook according to iron’s instructions (usually 3-4 minutes for my iron). Remove from iron and place on a baking tray. place tray in oven and keep waffles warm while making the rest. 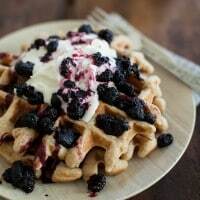 While waffles cook, combine black raspberries, maple syrup, and lemon juice in a small sauce pan. Bring to a boil and reduce to a simmer. Continue to simmer until ready to use. In a bowl, enthusiastically whisk heavy cream until it becomes whipped cream. Whisk in maple syrup. 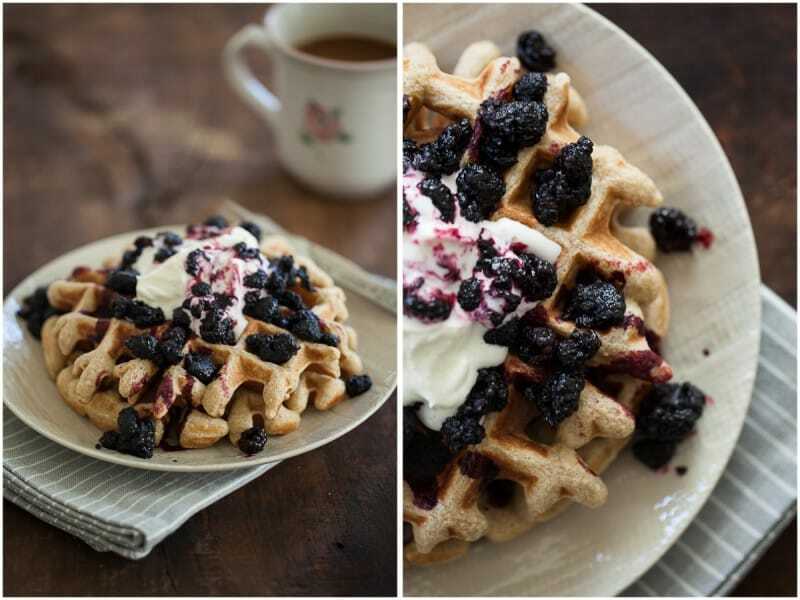 Serve waffles with a few spoonfuls of black raspberries and a dollop of whipped cream. Waffles with whipped cream is something I need to indulge in more often! Yum! This looks like my kind of breakfast. 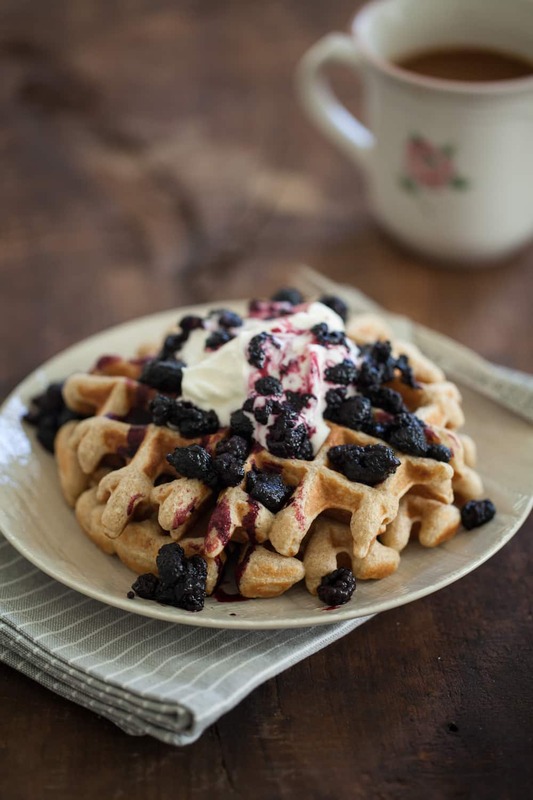 I also have some sorghum that I picked up in Louisville a few months back, and I’d love to try it with these waffles! Beautiful, as always, Erin. This looks like such a great breakfast (or dinner! ), I especially love that raspberry sauce. Looks really great, you’re making me jealous! I want these for dinner! They look perfect! I love summer berries! I need to start cooking/baking more with some of my more off-kilter flours! These waffles sound like such a lovely place to start. Unfortunately, I don’t think we get black raspberries here in the northeast…so red will have to suffice! 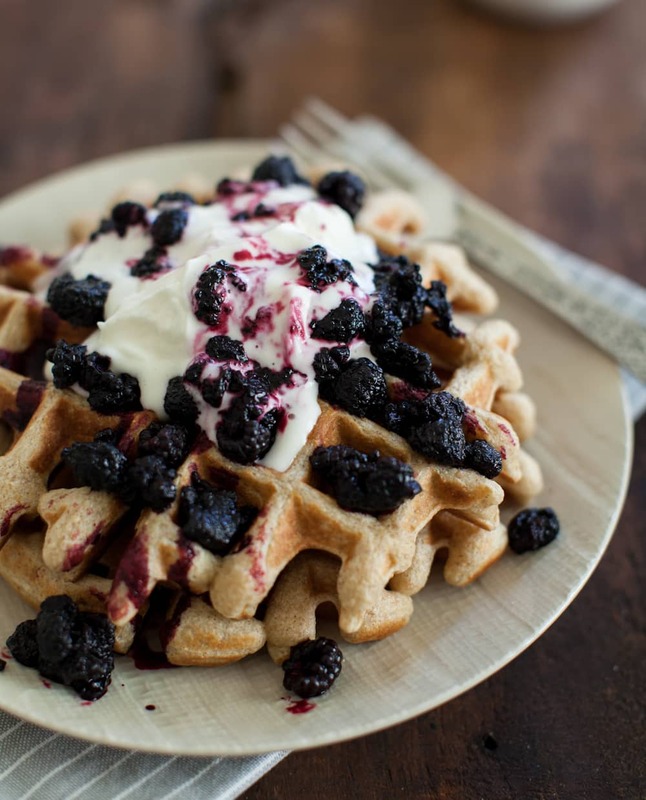 What a fantastic waffle recipe! I am loving everything about it.